August 31, 2014  She visited Africa with her presidential parents and found her calling. Barbara Bush talks about Global Health Corps, the group she started, and shares a "tweet of advice" for her volunteers. January 4, 2014  She was admitted to Houston Methodist Hospital on Monday for treatment of pneumonia. 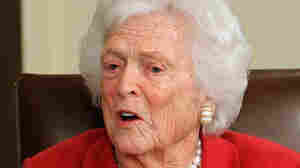 Bush, 88, responded well and is now at home, a family spokesman says. January 1, 2014  Barbara Bush, 88, is in a hospital in Houston with a respiratory-related issue, according to her husband's office. April 25, 2013  On the day her son George's presidential library is being dedicated, she tells Today that Jeb is "by far the best-qualified man," but that another Bush presidential run might be one too many. 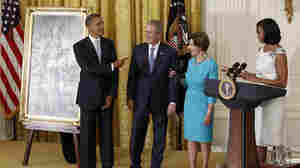 May 31, 2012  It's a White House tradition that brings presidents and former presidents together in a rare non-partisan event. Joe Scarborough Trashes Sarah Palin; Is N.J. Gov. Chris Christie A RINO? November 30, 2010  Few in the GOP, save maybe Lisa Murkowski and Barbara Bush, have publicly said anything negative about Sarah Palin. Joe Scarborough, the MSNBC host and former Republican congressman, showed no reticence in a Politico post. November 22, 2010  Barbara Bush has long been known for speaking her mind and she does it once again on Sarah Palin, saying she hopes Palin stays in Alaska. During her Larry King CNN interview she said she sat next to Palin once and thought she "was beautiful."